Would you love to know kind of Expensive Traditional Styles Worn by Nigeria Celebrities? If yes, then read on. Nigeria is a country with diverse culture, ways of live and style but one thing is common to all her people. Their traditional attires! Being in one of these traditional attires will make you feel attuned to the culture and of course keep with the trending style. No wonder the designers both local and international have recently incorporated this couture in the Expensive Traditional Style Worn by Celebrities across the country. Do you remember G-Fresh? Yeah! The same Gabriel Afolayan who recently got engaged. He has always looked dazzling enough but never has he appeared so cute like he was in this Aso Oke, an Expensive Traditional Style sewn to taste. This particular traditional style has often caught the attention of fashinista and Nigeria celebrities, but Gabriel Afolayan in this expensive traditional style portray his Yoruba decent in this Aso Oke. The color blend and the famous artist style will resonate in the mind of his fans & haters for long. Ofcourse, Odunlade Adekola, is probably your favorite actor so we know you are aware that he has a lot of expensive traditional style in his wardrobe. But have you seen what he Worn in this recent picture we just scoped? That’s regal. This expensive esiki made of Aso-Oke is the kind of native dress you’ll want to have in your collection to look like one of Nigeria celebrities. Ole, ole then she’s stealing my heart away…we can almost hear you singing the song now. Yeah, Tiwa Salvage sang that and it rocks. But aside from being a famous musician, she has skills in choosing her traditional style and you can bet when she choose, they are bound to be expensively cool. Here is one occasion we see won’t forget in a hurry. She how Tiwa Salvage glows in her expensive traditional style with the amazing dancing steps and pretty smile to match. I bet you want to dress like that now. Mercy Aigbe has always been one controversial celebrity among others who has always appear atop of her game at any circumstances, dressing cute and making sure she’s in tune with culture. Her taste in expensive traditional style cannot go unmentioned in our list. Here she is in one of those traditional styles and I can bet she shows how a celeb should look like. Well, the last but not the least on our list of top 5 expensive traditional styles Worn by Nigeria celebrities is Mz Folakemi. She might not be a famous celebrity like the rest of those that has made our list but she definitely has class and has a great taste when it comes to traditional fashion and style. Look at her elegant pose in elegant traditional style. I bet it dazzles you too. 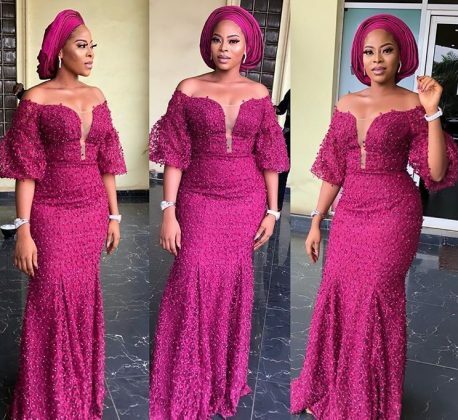 So, whether you just want to know the trending traditional style or you’ll like to own one of those dresses worn by Nigeria celebrities, our pick on top 5 expensive traditional styles Worn by Nigeria celebrities should lead you in the right direction. Do you have others that should have made our list but are no there? Please feel free to mention them in comment bellow.